Not just a new year but a new normal….rolling into 2019. Well 2018 went by in a bit of a blur didn’t it?! A quiet Christmas for me, and even quieter new year, think I was in bed by 10pm! I’m trying not to look at years in the same way anymore, more of rolling time, and whilst we all have to go to work, have appointments and commitments etc. my new way of thinking is just the cliche of living a moment at a time, enjoying the good, and coping and learning from the bad and ugly bits, spending time with lovely personalities in my life, not dwelling on negative energy or people, and no longer trying to be all things to myself and others, we are human and all with imperfections, its just too tiring these days to strive for the unattainable, and lets face it, life is way too short. I have made peace with this secondary Cancer that i’m now hosting in my body, no point stressing, more of living in hope with a crafty bit of denial thrown in to help time glide. For those that know me, I thrive on structure and boundaries, I get a little anxious and lack confidence in areas of life that I don’t feel I have a lot of experience in, so when I got that hideous cold over Christmas and missed two weeks of training, the plan to rack up so many miles went out the window, I had to really over-ride the voice that was screaming omg omg you’ve missed all those rides…. what now??? So thats my new philosophy on life, I quite like it, think it can be applied to most scenarios, not just cycling! Tonight as I write this (Friday the 4th of Jan 2019) I have spent the afternoon at Notts Police HQ meeting some amazing people and I have cycled on a Watt Bike for the first time, for those that haven’t seen all the social media, Police Control Room Inspector Dean Gallacher, having seen our campaign to raise money for cancer research decided to help us raise the profile, so from today on a watt bike a virtual bike ride is commencing from Notts Police HQ all the way to New York… New York Police have said they also wish to do the same back later in the year. So far today in just a few hours £160 has already been donated. 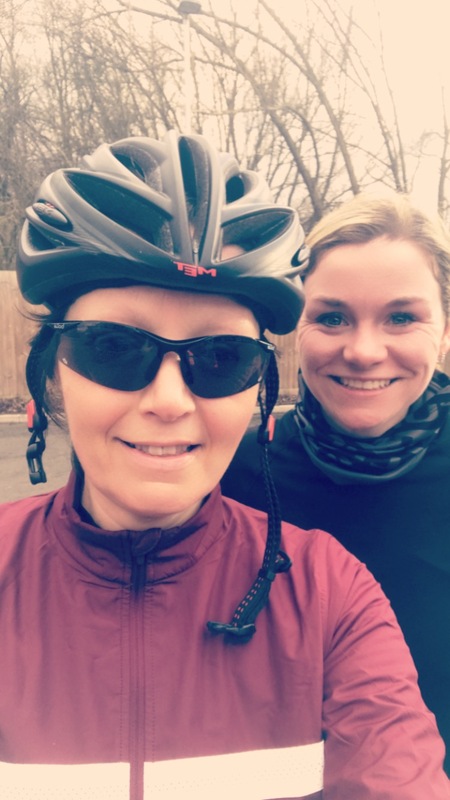 One staff member has ridden 25 miles in full uniform, complete with stab vest on, a member of the dive team is going to cycle in Dive kit, an officer in full riot kit… how can you not donate to that??! How long it takes to do the 4000 miles no one knows yet, I foresee some competitive people getting on that bike! During December all Watch’s at Mansfield Fire Station created a fire service calendar, generously put together by Linney’s the printers for free, 500 were distributed with some savvy people raffling one, which generated just short of £300 I think in total so far we are just past the total of £5500 on the calendar front. Half of this amount is being donated to the KMH Amazons breast cancer support group. I’m in total awe of all that has been imagined and put into play by some that were total strangers until recently, all in the name of a disease called Cancer, and the need to help find a cure for it. So whilst I am not doing any New years resolutions, purely because all mine were done in 2018, I had to give up alcohol and sugar thanks to drugs and my liver, I am however going to face my challenges whatever they are going forward with enthusiasm and enjoy every minute of the journey, I am so going to get to the top of those Lake district hills on July the 1st and I will be taking in those views and feeling proud that I got there, and with a lot of help and amazing people around me. Here’s to an amazing 2019 for everyone. We got this!! The Movie of the year…. highs and lows of this week….